Whether you are surfacing less or more than 20,000 board feet per shift a day on green or kiln dried stock, there is a Kimwood Lumber Sander specifically designed for your needs and production application. Many years of in production experience have consistently proven the many benefits of the lumber sanding concept. The Lumber Sander was just recently re-designed to use the same basic machine design of the Panel Master for its high quality and durablity. The Lumber Sander is available in 18" to 4' widths and can be equipped with a variety of head styles, depending upon the specific application such as the type of board, stock removals, feed speed and finishes required. Yield is greatly improved as a result of the Kimwood Lumber Sander's ability to remove an equal amount of stock from each face, thus requiring less material for finishing to size. 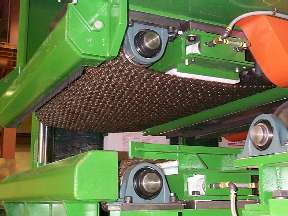 This unique feature allows an immediate or gradual reduction of green target size in the sawmill. Where the condition is thin boards, the lumber sander will clean up more thin boards. Because of our patented feedwork's ability to center the material to the abrasive heads, the sander will easily feed badly twisted, bowed, cupped and warped material without jamming. Consequently, you will receive the maximum possible length and width recovery of finished material from a given rough-sawn piece. By surfacing hardwood or softwood material by means of abrasive belts, you maintain or improve the rough dry grade so that no grade loss is experienced from the surfacing process. Because of the combination of characteristics of the Kimwood machine design and abrasive belts, such previous planer surfacing occurrences as roller splits-grain tearout-leafing of hard grains and rupturing grain around knot areas are all eliminated. 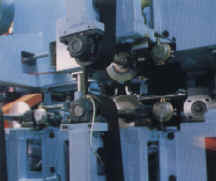 An added benefit is in the end product's close thickness tolerance and uniform finished surface. Increased feed speeds on the lumber sander allows yet another advantage of greatly increased production. In addition to the machine itself the flow systems are designed to increase efficiency and reduce labor from rough lumber infeed to finished product.